LoE only has 4 wings? A precious card against heroic bosses, they will just ignore it and go face. However, they will try to kill it with direct damage spells if it's alone on the board or it is the most valuable minion you have in terms of stats, with board clears if you summon another AI-threatening minion or have lots of minions, and or trade it with minions if when the armor is injured. That could make your runs thouger if you don't have Duplicate in your deck or Echo of Medivh as a more expensive solution. Anyway, great card! If you enjoy running heroics with your mage and have nothing to do with your dust I would even suggest to craft this card in gold! This card counters Emperor Thaurissan's Power of the Firelord. so I found a bit of a bug with Animated Armor so when I was against an aggro mage and I had four life left with Animated Armor on the field they decided to go face with the spell Fireball and my secret Ice Block activated. So this is a major bummer, because ice block activated when it was NOT fatal damage. My best guess why Ice Block activates is that the game thinks the fireball will kill that triggers ice block to activate before it hits. it depends which was played first. If Animated Armor is played before Ice Block, Animated Armor will reduce fatal damage to 1. 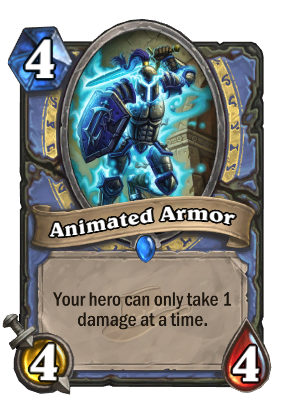 If Ice Block is played before Animated Armor, Ice Block will prevent fatal damage before Animated Armor can reduce it to 1. Imagine if Warlock could use it... Pit Lord might actually be viable. As I've seen others say, it'd be cool in some other classes, but it's kinda "meh" for Mage. It has a synergy with Wee Spellstopper and Ice Barrier. Most of people see this as 4/4 taunt but what they miss out is that it has taunt for the spells aswell which is really important in some matchups. This feels like an incomplete concept that they could flesh out down the road. Tanky Ice Mages for Control? Even more annoying if you gave bolf spell immunity from wee spellstopper. I just had the opportunity to test Animated Armor + Bolf Ramshield and apparently Bolf still takes all the dmg that was intended.. I was attacked by a 2 attack minion and Bolf took 2 dmg instead of the expected 1 dmg. Pretty fun card, I worked it into a deck and it kinda went sideways for the other guy.